The symbiosis of vineyards, orchards and agriculture is the future of Martin Kohl. With a diploma from the College for Viticulture and Permaculture, many years of practice with renowned winemakers in Austria, America, and New Zealand, and his high motivation provide a solid basis for the future of the company. Martin´s goal is to ensure the national and international presence of their wines. Combining traditions and modern trends for the past 350 years, the history of our family has been defined by a down-to-earth and dynamic approach while having the courage to take up something new – and this is reflected in their wines. Their home soil – gravel south facing slopes with rich loess soils – form the foundation for high quality, allowing us to produce distinctive wines. 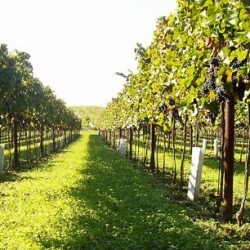 Sustainable farming, yield regulation and precise trimming and pruning are the prerequisites for this. The special quality of our wines has been confirmed by numerous awards.